1 What is premature ovarian failure? As human female ovaries are played reproductive and endocrine functions, then premature ovarian failure is the condition where the ovaries are not functioning properly before 40 years of age. Failure of the ovaries causes insufficiencies of reproductive hormone estrogen and also eggs production is less. All these insufficiencies cause infertility. Some misconception is there that premature ovarian failure is related to premature menopause, but both the conditions are not same. In case of premature ovarian failure, irregular menstrual cycle is occurs and there are always chances of become pregnant. In case of menopause, total stoppage of the menstrual cycle and there are no chances of becoming pregnant. Menstrual cycle irregularity which can even stay for prolonged periods (several months or years also). It can develop after childbirth or discontinuation of contraceptive pills. In normal condition human ovaries contain sacs like structures which are known as follicles. In each month with the help of secreted hormones during menstruation cycle, only one follicle reaches for maturation. Image 3 – Hormones released by organs at various levels that are essential for normal egg release. 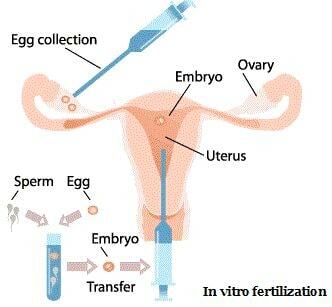 After maturation, the follicle becomes bursts and eggs are ready to fertilize in the fallopian tube. 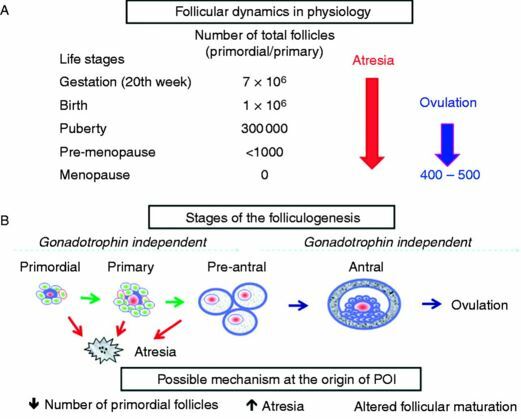 Naturally follicle depletion occurs after menopause, but early aged follicle depletion is cause of premature ovarian failure. Chromosomal defect like Turner’s syndrome causes presence of only single X- chromosomes instead of double. In case of fragile X syndrome which causes mental retardation. Premature Ovarian failure is another result of chemotherapy and radiation therapy. Genetic material impairment due to chemotherapy and radiation therapy causes premature ovarian failure. Other than this environmental smoke, chemicals, insecticides, pesticides and infecting agents such as viral attacks also cause premature ovarian failure. When follicles are not working properly and remain inside the ovaries and not travel towards follicle tissue cause follicle dysfunction. In certain diseases, the body’s own immune system acts against ovarian tissues and causes follicle damage. It has been noted that viral and bacterial attacks mainly cause immune system impairment. Some women born with low number of follicles and each menstrual cycle less amount of follicles are mature for releasing eggs. Supporting follicles need to mature others follicles and lack of these causes premature ovarian failure. Glactosemia is a metabolic disorder which affects how body utilizes sugar (galactose) and almost 80% of women who are having glactosemia develop Premature Ovarian failure. For diagnose the premature ovarian failure, the communication with doctors about sign and symptoms is the initial step. Details questioning about the menstrual cycle occurrence, history of exposure of radiation or chemotherapy or any other chemicals are usually asked by the doctor during the first visit. After analyzing the sign and symptoms, doctors conduction physical examination followed by pelvic examination. One of the major signs of missing a menstrual cycle is pregnancy. Pregnancy test helps to understand the onset of unexpected pregnancy. 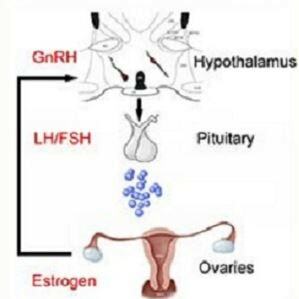 FSH secreted from the anterior pituitary gland for stimulating the follicles in the ovaries. In case of premature ovarian failure, high level of FSH in the blood is common findings. The blood test is specifically conducted to check the estradiol (estrogen) and in presence of premature ovarian failure, the result is abnormally low. Prolactine hormone is responsible for breast milk secretion and also delays the ovulation. In case of premature ovarian failure, the result is abnormally high. This test is conducted for examine for chromosomal abnormalities. Some premature ovarian failure is the result of woman having single X chromosomes instead of double and some female have other chromosomal disorders. This test is conducted for testing the fragile X syndrome. This is a genetic disorder and causes cognitive impairment. Some females have premature ovarian syndrome due to fragile X syndrome. Estrogen replacement therapy usually provides the symptomatic relief which includes hot flashes and also for prevention of osteoporosis. If the ovaries are unable to produce estrogen, then this hormone replacement therapy helps to maintain the level of the estrogen. To protect the precancerous growth of the endometrium, a combination of estrogen and progesterone is prescribed. 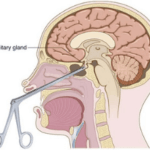 This combination can provide vaginal bleeding again, but unable to repair ovarian function. This therapy usually given up to the age of 50 to 51, depending upon the physical health of the patient and also the doctor’s own choice of prescription. Though prolong combination therapy for estrogen plus progestin has side effects related to cardiovascular diseases and breast cancer. Premature Ovarian failure develops the risk of osteoporosis, for preventing these complication doctors may recommend calcium and vitamin D supplement after bone density measurement. Premature ovarian failure causes infertility. 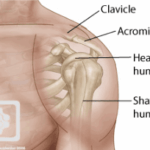 The lack of estrogen causes porosity of the bone and leads to Osteoporosis (brittle bone). Estrogen also helps to maintain the mental stability; lack of estrogen causes mental irritability, anxiety and depression.